Asking for Letters of Recommendation. This is the time of year when students need letters of recommendation from our faculty. Students applying for admission to law school or graduate school will need letters of recommendation to complete their applications; students applying for post-BA opportunities in the Peace Corps or Teach for America or similar organizations will need recommendation letters; within our Department, applicants for the Wellman Hill Public Service Internships will need a letter from a CWRU faculty member, and many students prevail upon the POSC faculty for such letters. Here are some suggestions for students seeking letters of recommendation from faculty in the Department of Political Science. Students should think about the purpose of the specific letter they are requesting and who, among the faculty, might be the most appropriate person to write that specific letter. Generally, the best person will be one’s academic advisor or a faculty member with whom the student has had one or more courses and where the student has been successful in the course. Many recommendation forms require the referee (the person writing the letter) to explain how, and how well, he or she knows the student. Requests that a faculty member write a letter of recommendation should be made in person, face-to-face, rather than as an email message. A discussion about a letter of recommendation can be very helpful to the faculty member who agrees to write the letter. It helps a faculty member to understand how to craft the letter and how best to leverage the student’s strengths for a positive (and ultimately helpful) letter. Faculty members are free to decline requests to write letters of recommendation. We do not decline on the basis of disinterest, but primarily on the basis that, as individuals, we may not be the most appropriate person to write the letter. A tepid or under-informed letter of recommendation is not helpful. A face-to-face discussion with a faculty member will help to clarify who might be a better alternative referee for a student seeking a letter of recommendation. Faculty members are busy persons. We have papers and exams to grade, other letters of recommendation to write, manuscripts to review for journals and presses, meetings to attend, reports to write, articles to submit or to revise and resubmit to scholarly journals – all of these tasks (and more) are routine, perpetual, and have serious deadlines. So: students should anticipate well in advance the need for a letter of recommendation and the deadline for such letters. Provide our faculty with at least two weeks’ notice of the need for a letter. This is not only a professional courtesy; it increases the likelihood that the faculty member will be able to write a letter of recommendation and will be willing to do so. As a condition of writing a letter of recommendation, some faculty ask for substantial information about each application for which a student is requesting a letter. This information may include 1) the student’s application (or personal) statement, 2) the requirements of the position or school, 3) a copy of the student’s résumé, and 4) the student’s unofficial transcript. This kind of information supports faculty members in writing the strongest possible letter of recommendation. The strongest letters are those that “sing in harmony” with the student’s application (for a job, for admission to graduate or law school, for an internship). General “all-purpose” letters of recommendation are, generally, not helpful, and certainly not as powerful as the kind of carefully crafted, targeted letters that our faculty can write when we have full information well in advance of a deadline. Providing such information to a faculty member from whom a student is requesting a letter of recommendation is also, again, a professional courtesy. Two final points about letters of recommendation. Let the referee know the outcome. Students should be sure to let those who have written letters of recommendation for them what the outcome of the letters were. If a student has won the scholarship, or was turned down by a law school, or has been accepted by the Peace Corps, the student should share the information with the referee. Thank the referee. Students should always thank the faculty members who have written letters of recommendation for them. A simple note of thanks is appropriate (and sufficient). Registration for Spring 2019 Courses. Registration for next semester’s courses continues apace. The registration schedule can be found here. Be sure to meet with your academic advisor to discuss your plans and to review your progress toward completing the CWRU requirements for graduation. For those POSC majors intending to enroll in POSC 396 Senior Capstone Project in the spring, this is also the time to start discussing your ideas for your capstone with several faculty in the Department, to find an appropriate capstone director. A reminder from last week’s Newsletter: the Department is offering courses this year that have not recently been available. These include two courses to be taught by Professor Matthew Hodgetts: POSC 351 Modern Political Thought and POSC 388 Policy, Politics, and the Global Environment (which satisfies a requirement for the Environmental Studies major and minor). Professor Parris will offer POSC 367 Western European Political Systems. In addition, Professor White will teach POSC 385 Doing Government Work: Public Administration in the US, and Professor Buchler will offer POSC 349 Research Methods in Political Science (especially helpful for students undertaking capstone work). See here for the full listing of POSC courses available this spring. 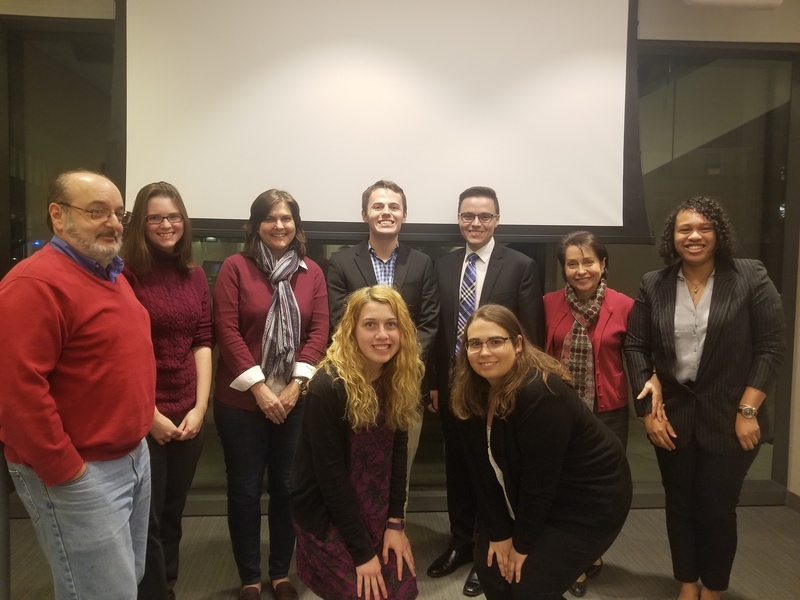 On Wednesday, November 14, seven Political Science majors presented their Capstone research. They were joined by friends, family, Political Science majors, and faculty. Congratulations to all of them for their hard work! For more pictures of the presentations, check out our Facebook page! Stay up to date with events happening on and around campus at our new Political Science Events page! Have events you’d like to share with us? Send us an email at posccalendar@case.edu. We’ve recently redone our Internships and Careers webpage! Check it out for updated internship, fellowship, funding, post-graduate, and career information! Have any opportunities you’d like to share with us? Send an email to politicalscience@case.edu! Stay up to date with the department by following ourTwitter feed! Check it for day to day opportunities and information! Tom Mrosko, Director of the Migration and Refugee Services Office of Catholic Charities in the Diocese of Cleveland, will discuss how refugee resettlement is changing in Cleveland. RSVP to global@case.edu. Join us as Professor Blackwell brings his expertise from over 40 years of research in polymer physics to bear on explaining the obstacles and alternatives of recycling. The Social Justice Institute and La Alianza invite you to a celebration of poetry, art, and music to raise money for HOLA in Northeast Ohio, a grassroots organization that focuses on community organizing, leadership development, civic engagement, and immigration reform. Tickets are $5. 2017 was a catastrophic year for weather-related loss of life around the globe. The climate crisis has arrived and public health officials must learn to deal with the effects of today in addition to searching for solutions for tomorrow. Learn what decision makers should know in order to better understand the climate and reduce current and future climate risks to health from disease, disasters and malnutrition. Student tickets are $6. This talk reflects on the lessons learned from Isreal’s three wars with the Hamas and the tensions that continue today. Dr. Yael Aronoff will examine what challenges Israel faces when navigating dilemmas posed by conflict with non-state actors. Nonmember cost is $10. November 20, 7-8:30pm, Forest Hill Presbyterian Church, 3031 Monticello Blvd. The first meeting of the Immigration Justice Book Club will feature a discussion of Violent Borders: Refugees and the Right to Move, by Reece Jones. The club is open to everyone who wants to learn more about immigration and seeks to bring people together from across the immigrant rights community. Subsidized transportation for CWRU students to the church is available. RSVP to socialjustice@case.edu. Leaders of the right to counsel movement in New York will talk with Cleveland City Council members on the role of these programs in decreasing eviction rates and homelessness and limiting the financial burden carried by cities. Nonmember tickets are $35. Live stream the event here. Food is for eating. But it also provides a vehicle for expressing ethnic pride and national identity. Sometimes food articulates conflict, and other times it serves to foster coexistence. Ari Ariel, adjunct assistant professor at University of Iowa, will discuss how these dynamics play out. Tickets are $10 for nonmembers. Register here. Jews began leaving Yemen to immigrate to Ottoman Palestine (later Israel) as early as the 1880s, and their migration continued until recent years. In this lecture, Ari Ariel examines the strategies this group has used to maintain a connection with Yemen, and to resist pressures to assimilate into the wider Israel society, while also working to integrate into their new homes. Nonmember cost is $10. Register here. Join undergraduate students Hannah Clarke and Geneva Magsino as they share their successful experience with Projects for Peace and learn how to apply for the award! Unopened boxes of tampons, pads, and diva cups are being accepted for donation. Friday Lunch: Just How Powerful is Putin? Check out our Political Science Events page for additional events happening on and around campus! The Baker-Nord Center and the Career Center have teamed up to offer scholarships to support undergraduate humanities majors working in unpaid internships. The C-SPAN Internship Program seeks to utilize the talents and education of students like yourself who are interested in communications and politics. During your internship you will become familiar with the workings of a cable television network and you’ll get a front row seat to the political process. Applications should be submitted at the earliest possible date. The JET Program is a competitive employment opportunity that allows young professionals to live and work in cities, towns, and villages throughout Japan. Most participants serve as Assistant Language Teachers and work in public and private schools throughout Japan; some work as Coordinators for International Relations as translators. Applications are due November 17. The Digest is seeking qualified students for a limited number of internships for Spring 2019. Student writers and researchers contribute to weekly issues by aggregating and writing condensed versions of news articles found in Latin American sources. Contact wjohngreen@latinamericannewsdigest.com for question. Applications are due November 26. This is an intensive language and cultural immersion program that allows students to pick one of 15 languages to study overseas. Applications are due November 27. Rumi Forum is offering unpaid, flexible internships this spring. Contact internships@rumiforum.org for more information. Applications for Spring Internships are now being accepted. CIEE offers multiple programs of varying lengths to teach English in nine different countries.Applications have varying deadlines, check online. The VOC is seeking spring 2019 interns who possess a commitment to educating people about the history of communism and the dangers of collectivism. The internships are based in Washington, D.C. Click here for the available internships and how to apply. Internships are available at this Cleveland-based interfaith group that promotes peace and human rights in Central America and Colombia. Apply online. The Association of Public and Land-grant Universities (APLU) offers Washington, DC-based, unpaid internships for students with an interest in politics and the political process, and especially for those interested in higher education and/or science or technology policy. Applications for Fall, Spring, and Summer internships are due one to two months prior to the internship start date. To apply, submit a cover letter explaining your interest in the position and your availability, along with your resume to cgainternship@aplu.org. Contact Karin Wishner at (216) 781-4560 ext. 5010 or kwishner@uscrioh.org for internship opportunities. UST, an immigrant and refugee services organization, is currently seeking two interns. Interested students can apply here. Graduating college seniors can apply for a $15,000 stipend to pursue a year of public service anywhere in the world. Application is due January 18, 2019. Scholarships for varying lengths of international study are available for students interested in national security. Applications are due February 7, 2019. The Office of the Ohio Public Defender welcomes contact from current law students, recent graduates, and other interested parties who are seeking volunteer opportunities. We accept applications for unpaid positions on a continuous rolling basis, so interested parties may apply at any time. MedWish repurposes discarded medical supplies to developing countries and relies on volunteers to sort supplies. Contact Caley Haehn with questions: volunteer@medwish.com or 216-692-1685. Students interested in doing an internship in Berlin can apply for an 8-week placement on a full-time basis (35-40 hours per week). Apply online by December 1. The CDO is seeking applications from advanced Ph.D. students and early career researchers and organizers for participation in a summer training institute focused on the study of democracy and organizing. Summer 2019 applications are due December 17. The Cleveland Fed is offering a variety of summer 2019 internships. Search intern job openings and apply online. Applications are due December 7. Applications are being accepted for this 3-week academic program which is open to undergraduate students with an interest in international relations and conflict resolution. Applicants seeking funding for the program must submit the completed scholarship application form, the accompanying academic reference, and the general program application form by December 12. Contact alex@redtreestudy.com for more information. This five-week program at Duke University is designed to introduce to the world of doctoral study in political science to undergraduate students from under-represented racial and ethnic groups or those interested in broadening participation in political science and pursuing scholarship on issues affecting underrepresented groups or issues of tribal sovereignty and governance. Applications are due January 18, 2019. The Cleveland Foundation Summer Internship Program provides talented and diverse undergraduate students and recent college graduates an opportunity to work with Cleveland-area nonprofit and public sector organizations in an 11-week paid internship. Interns also participate in and coordinate weekly seminars highlighting key organizations and programs being conducted in the local nonprofit and public sectors. Applications are due January 21, 2019. The eight-week Summer Research Program enables students from any university to develop expertise in one of two tracks: Public and Global Health Track and Aging and Neurological Diseases Track. Students may apply to one or both programs for which they qualify, but may only be accepted into one program. Applications are due February 1, 2019. SSI is a fellowship program for rising college seniors. This paid seven-week summer fellowship program is designed for U.S. citizens and permanent residents interested in pursuing graduate degrees and careers in the information security sector. Priority applications are due February 1, 2019. Applications for this twelve-week, paid, summer internships are now open. Students interested in U.S. social insurance and related issues are encouraged to apply for one of the Academy’snationally-competitive internship programs. This listing was forwarded by Professor White, who is a member of the NASI and can tell interested students more about the organization. Applications are due on February 1, 2019. This six-week program offers students a greater understanding of careers in international affairs. Applications are due February 5, 2019. Exceptional candidates who want to enrich the field of contemporary French, British and/or European studies, with an approach that is pluralistic, inclusive and interdisciplinary are invited to apply for this program. The CLC has an open position for General Counsel. Contact Debbie Tang or Tory Clarke for more details about this opportunity. Listen to Political Science Professor Justin Buchler discuss “Civility in Politics, Age Discrimination Law” on The Sound of Ideas.